Being the foremost names of the industry, we are engaged in offering a broad series of Tower Bolts to our honored patrons. 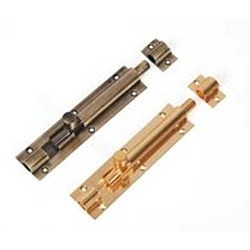 Established in the year 1968, We Ellar Sales Corporation are a well-known wholesale trader of Door Handle, Door Hinges, Door Stopper, Drawer Handle, Steel Khunti, Door Knob and many more. The offered products are extremely used by valued clientele for their high strength, durability, longer service life and low maintenance. Our offered products are procured from industry certified vendors who have rich industry skill and experience. As well, we provide these products in varied specifications at affordable costs to the clientele.